These Dinosaur printables are to be used with children from 2 to 7. This pack was made to go with the following books Dinosaur (Picture Books) by Anna Milbourne & Mandy Field , Stomp, Dinosaur, Stomp! by Margaret Mayo and Alex Ayliffe , and Dinosaur Bones by Bob Barner . Royal Baloo also made a kindergarten pack that goes with this. Please be sure and get that pack as well. Click here for information on how to play the barrier game. This information is by Playing with Words 365. 3 Part Cards, Beginning Sounds, Matching Cards, Read Write the Room, Which One Is Different, What Comes Next, Pre Writing Practice, Pattern Cards, 10 Piece Puzzles, 4 Piece Puzzles, Clip and Count Cards, Size Sorting, Color the Pattern, Barrier Game, and more. Click here to get your copy of Royal Baloo's Kindergarten Dinosaur Pack. Click on the files below to download your copy of the Dinosaur. 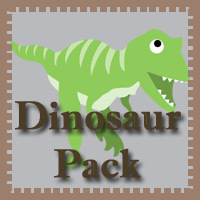 Click here to get your copy of Royal Baloo's Kindergarten Dinosaur Pack Update. 25 pages of Dinosaur Dot marker fun!